In Landscapes Carry Meaning, the user is first presented with four options from which to select a base painting. Crystal Bridges Museum of American Art collaborated with Ideum to develop an interactive for the groundbreaking exhibition, Picturing the Americas: Landscape Painting from Tierra Del Fuego to the Arctic (Nov. 7, 2015 ­- Jan. 18, 2016), which explored the changing Americas from the 1840s to the 1940s through the lens of landscape painting. 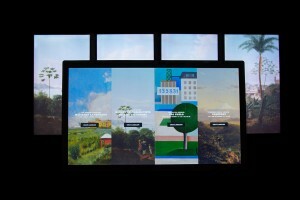 The Landscapes Carry Meaning interactive application invited visitors to compose their own landscapes based on paintings in the exhibition, then share their creation on social media. To create the base paintings, illustrators and artists painstakingly digitally removed features (trees, buildings, people, animals, etc.) from images of the paintings and filled in the missing spaces. User selects a meaning for the boat he has placed in his landscape. Visitors chose from among four base paintings, all of which had the majority of their features­­ ­­edited out. After a visitor selected their base painting, they chose three to seven objects to add to the landscape. 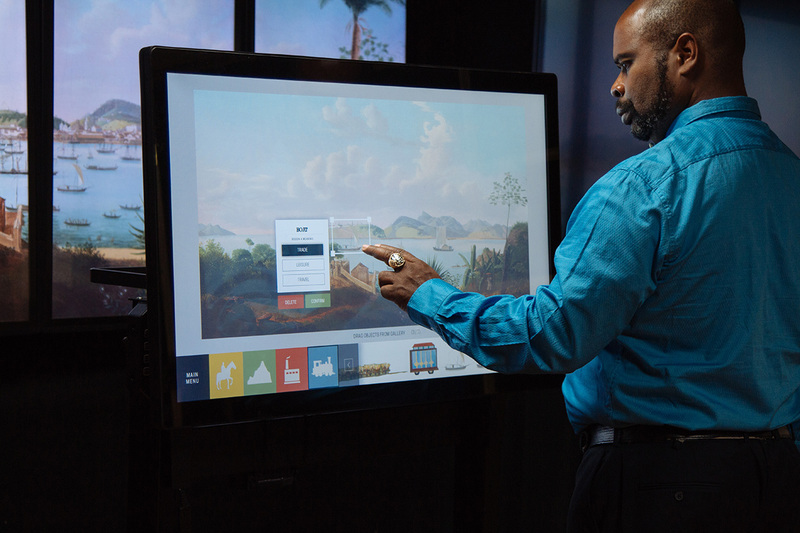 The available objects came from each of the four base paintings in the interactive and fell into the categories of People and Animals, Landforms and Vegetation, Buildings, and Transportation. Visitors were able to effectively mix and match, choosing objects from any of the four paintings to create their own composition. The visitors could also place, rotate, and resize each object to truly make the work their own. A user reviews his final landscape and chooses to share his creation. Visitors were required to consider and choose a meaning for each object they added to the landscape. In this way, visitors were exposed to the same process landscape painters follow of carefully deciding what to place in their work, and to think about why exactly it should be there. 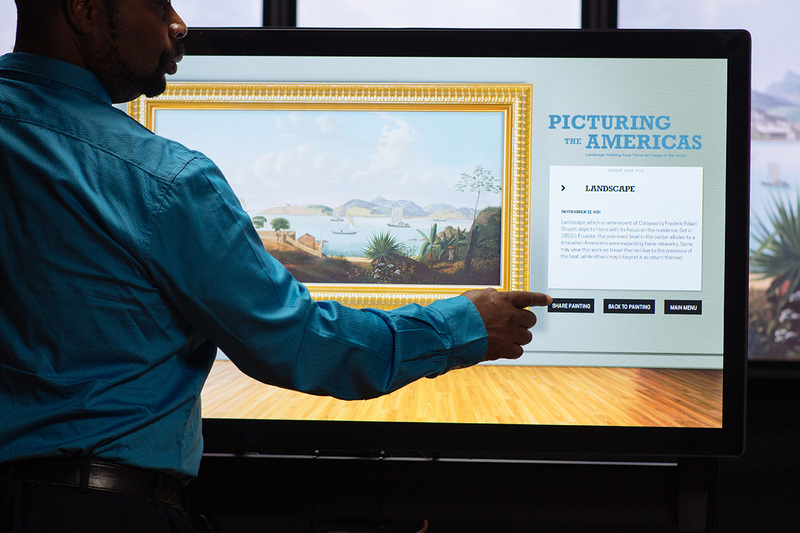 When they finished, visitors were able to view their work of art in a digital gallery setting complete with label copy generated based on what base painting, objects, and meanings they chose (and did not choose). Then they shared their work of art by emailing it to themselves or posting it to Crystal Bridges’ Tumblr gallery. 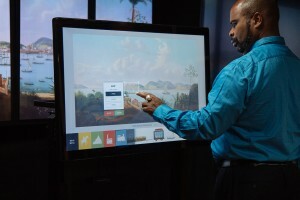 The application ran on an Ideum Presenter 46 multitouch wall, which Crystal Bridges also used earlier in 2015 for another interactive, the Warhol / Wyeth interactive photo kiosk. To see more, visit the Flickr album and watch the video on YouTube. Although the project is no longer on view at Crystal Bridges, it is available for viewing at Ideum’s studio in Corrales, NM or via Skype.